Tax time is upon us. And with your tax refund comes the risk of being targeted by fraudsters attempting to steal your tax refund. The scams come in two versions. A tax-identity theft scam is where the fraudster has access to your identifying information such as your social security number, full name, address, and maybe even work and pay information. The fraudsters files a fake 1040 using your information but forwarding the refund to an account or address within their control. For this to work the fraudsters must file the refund before you. Therefore, early filing can reduce the risk of this happening. The other type of tax-related scams is receiving a communication, primarily a phone call from a person claiming to be an IRS agent and asserting that you owe money. The announcement of the false claim that you owe money is followed by threats if it is not paid immediately. The threats can included imprisonment. Please be aware: THE IRS DOES NOT CALL YOU TO COLLECT DEBTS. They send letters if you owe a debt and if you do not respond via mail they will move forward with liens on your property, levies of your bank account, or garnishment of your wages. THE IRS NEVER CALLS TO THREATEN YOU. This IRS impersonator scam can be used any time of year to try to extract money out of you. You should also be aware that since your bankruptcy information is public record general information like your full name, address, and the last four digits of your social are available. Similar scams have targeted bankruptcy filers after they receive their discharge. There are a few warnings that might trigger you to investigate whether your social security number has been compromised and is being used. 4) You receive a suspicious letter claiming you owe back taxes. In all of these situations call the IRS directly via the publically advertised phone number on their website to confirm the communication is legitimate. What Can You Do If You Are A Victim Of A Tax Scam? Here is what to do if you suspect you are a victim or believe your tax refund is being targeted by scammers. 1) Act Quickly – Do not delay. 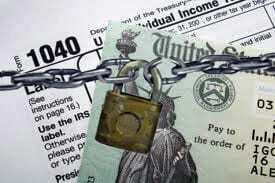 2) Call the IRS Identity Protection Specialized Unit at 1-800-908-4490. 3) Fill out and forward an IRS ID Theft Affidavit Form 14039 with proof of your identity, such as a copy of your Social Security card, driver’s license or passport. 4) Keep records of when any calls were received and the details of the conversation. The same is true for letters. Keep copies. 5) Contact the three major credit reporting bureaus and put a “Fraud Alert” on your records. 6) Order a copy of your credit reports to determine whether any other damage has occurred. 7) Visit the Federal Trade Commission website (https://www.identitytheft.gov/#what-to-do-right-away) and file a report. The best precaution you can take is to be careful of disclosing your social security number via the internet. Your name and address are everywhere. Scammers need your full social security number to pull of most tax related scams.